Our friend Steve DiMiceli from WeWearTheRing.com reached out to me for my 2014-15 A-10 preseason rankings and in keeping with tradition, I turned them in late yet again (mind you by just a few hours this time). Hopefully DiMiceli will grant me some leniency this year and my votes will count toward his highly-anticipated bloggers poll but either way I wanted to share my rankings with you all, which include a quick blurb about each team. 1. 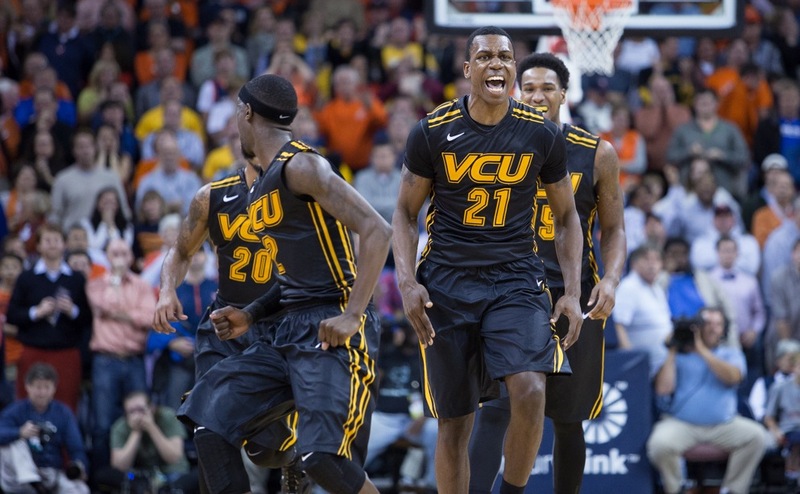 VCU – “This should be Shaka’s most talented team yet”. We heard that last season as well but VCU proved to have a difficult time against good teams when they weren’t playing at the Siegel Center (8-9 against kenpom top-100 away from Broad St). Mo Alie-Cox upgrades the defense which is a scary thought but they’ll need to hit shots better than last year to remain a top-25 team. 2. Dayton – Close call between the Flyers, Colonials and Minutemen. Either of the later could end up going deeper in the postseason but Dayton should finish higher in A-10 standings due to what I think are easier home-and-home A-10 schedule pairings (although they do travel to UMass and GW with no return game, so could be key in tie-breaker scenarios). 3. George Washington – Colonials return the pieces inside and out to challenge for an A-10 title but hard for me to ignore the jump they made with Creek. Armwood a major loss on defense. 4. UMass – The departure of 5’9 Chaz Williams leaves some big small shoes to fill. Fair or not, college basketball will all be watching Derrick Gordon. 5. Rhode Island – “There’s an old saying in Tennessee — I know it’s in Texas, probably in Tennessee — that says, fool me once, shame on — shame on you. Fool me — you can’t get fooled again.” The talent appears to be there, but is this the year they actually do make an A-10 jump? 6. Richmond – The Spiders struggled without Cedrick Lindsay but I still like their best five. 7. Saint Joseph’s – Easily one of the biggest wildcards heading into next season based off the departure of their big three and return of super soph, DeAndre Bembry. I honestly have no clue how good they’ll be, but I like Bembry enough to rank them in the top half of the conference. 9. La Salle – Zack + Wright could be one of the better frontcourts in the conference, but having seen how much they struggled with losing one good guard last season, it’s hard to imagine what happens when they lose three more. 10. Saint Bonaventure – Mark Schmidt has had these guys competitive in six of his seven seasons at SBU (his only REALLY bad year being his first, 2-14 in conference). I trust he’ll do that again, even with the loss of some solid senior pieces. Ndoye will be a first-team contender. 11. Duquesne – Just do us all the favor and let Mason hoist em up from range every game. He should be putting up Troy Daniels-like attempts after leading THE NATION in offensive rating last season. I know I have them way to low…I just know it. 12. Saint Louis – It seems crazy to think a team that has finished first the last two regular seasons finishes 12th. McBroom and Youcaobou could surprise everyone, but I think they struggle at the true beginning of the Jim Crews era. 13. George Mason – I’d take Jalen Jenkins on my team in a heartbeat but I expect another bad year with the losses of Wright and Allen. Paul Hewitt has an annoying year ahead of him. 14. Fordham – With all due respect…it’s just where they belong. I have to say, this year’s rankings were particularly hard with a number of last season’s top teams losing key pieces while some of the teams from the bottom half return much of the rosters that didn’t do so well for them last season. SLU and Saint Joseph’s are two of the hardest to figure out. The Billikens and Hawks were two of the better teams but lose basically their entire starting lineups outside of two players combined (both Hawks). On the other end you have a team like Rhode Island that will once again become a chic pick to finish toward the top of league, yet is still a team coming off a five-win conference season this past year. And where do you put Davidson? Will they struggle in this new weight class or will the McKillop machine keep adding up the wins? Join the discussion and throw your rankings out for all to critique in our A10talk.com forum discussion on the subject here: Your 2014-15 A-10 Preseason Rankings. Chris Neal liked this on Facebook. Eddie Johnson liked this on Facebook. AnnaandJimmy Wegman liked this on Facebook.